PMA 2004: Lexar has today announced its 8GB Professional Series CompactFlash card, the highest capacity memory card available in the world today. In addition to delivering extraordinary capacity in a matchbook-sized memory card, Lexars new 8GB CompactFlash card delivers a 40X speed-rating, signifying a minimum sustained write speed capability of 6MB/s. The new 8GB CompactFlash cards will be available at many photo specialty stores in May of this year. Pricing for the 8GB card will be released at time of shipment. Las Vegas, February 12, 2004 (PMA Booth H100)-- Lexar Media, Inc. (Nasdaq: LEXR), a leading manufacturer and marketer of high-performance digital media and accessories, today announced its 8GB Professional Series CompactFlash card, the highest capacity memory card available in the world today. In addition to delivering extraordinary capacity in a matchbook-sized memory card, Lexars new 8GB CompactFlash card delivers a 40X speed-rating, signifying a minimum sustained write speed capability of 6MB/s. By maintaining a close alignment with manufacturers who offer high-end digital cameras that create high-resolution files - which can be over 8MB each, Lexars new 8GB memory card meets the needs of professional photographers who require capacity, speed and reliability - in an easy-to-handle removable media format. 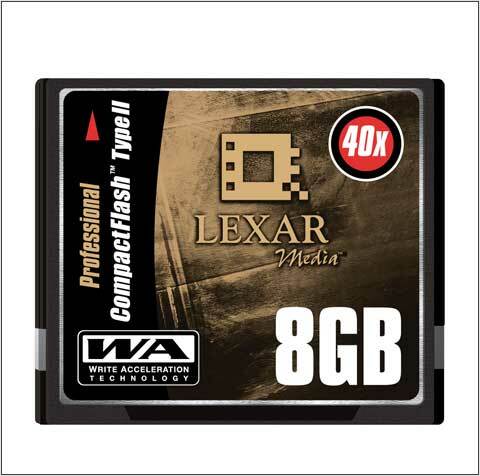 In addition to delivering the worlds highest memory card capacity, Lexars new 8GB CompactFlash cards deliver high-speed performance, and incorporate Lexars new Write Acceleration (WA) technology to provide increased in-camera speed performance in high-resolution CF cameras on the market. The new Write Acceleration includes optimized firmware to reduce overhead associated with transferring data, and provides a larger controller buffer to accommodate transferring up to 32 sectors of data in one command, in cameras supporting this feature. Lexar Medias 8GB CF cards will also include a free copy of the companys award-winning Image Rescue 2.0ä image recovery software. Like Lexars 4GB CompactFlash card, the 8GB card is CompactFlash Type II and requires the host camera to support the FAT 32 file system. The new 8GB CompactFlash cards will be available at many photo specialty stores in May of this year. The cards include a lifetime warranty, unlimited access to Lexar Medias dedicated technical support team for professional photographers, and a free trial version of Photo Mechanicä image management software. Pricing for the 8GB card will be released at time of shipment.